We’re so excited to share a preview of the soul food and magic lined up for #SCCTurns3! We look forward to seeing you tomorrow! For live updates, follow #SCCTurns3 on Twitter and interact with the Facebook event. Update – #SCCTurns3 Bazaar and Open Mic! We hope this message finds you well. We’re only two weeks away from our #SCCTurns3 Bazaar and Open Mic! We are truly grateful for the many blessings of building, sharing, and healing with each other since 2012. Here is our long-awaited update on the big day. Be sure to share the flyer and event page with friends and family! #SCCTurns3 will be taking place on Saturday, December 12th at Mainchance (120 East 32nd Street). There is a suggested love donation of $5 at the door and food will be available by the plate for for a sliding scale of $5-7. We strongly encourage guests to bring cash. We there will be goodies for sale during our community bazaar from 5-7pm, followed by an open mic from 7-9pm and a dance party to close out the night. The celebration is an intergenerational space that is open to all genders,spirits! Accessibility – The event will take place on the second and third floor. While the building does not have an elevator, we will have someone from our team assisting people navigating the staircase. Directions – The closest trains are 6 to 33rd Street, B/D/F/M to 34th Street, or the N/R to 28th Street. Calling all the healers, artists, musicians, poets and more – there is an opportunity for you to co-create the magic of the #SCCTurns3 celebration! Share your magic during the event as a vendor, performer or both! Vendors can sell crafts and services with the community during the Bazaar (5-7pm). We ask that vendors donate five percent of their earnings to the wonderful space, Mainchance. Performers are welcome to showcase their magic at the Open Mic to represent the creativity of our community and serve as a safe space to share stories of struggles, resistance, magic, and the beauty of people of color. Let us know how you would like to add to the space by filling out this form. Please keep in mind that space is limited, so be sure to fill out the form as soon as possible. We are so blessed to celebrate this milestone with you and look forward to seeing you on the 12th! 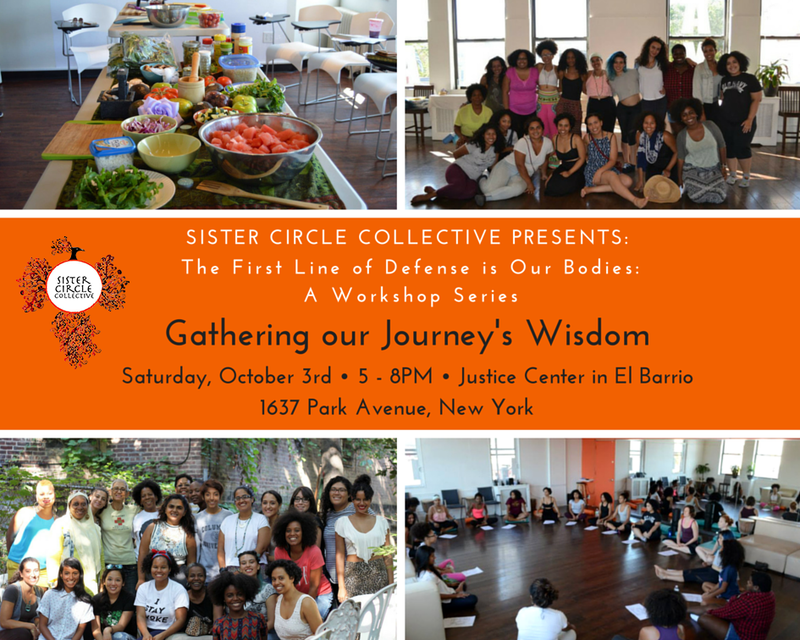 We’re please to invite you to join us for our final workshop, Gathering Our Journey’s Wisdom, as a part of The First Line of Defense Is Our Bodies series! The final session will focus on the energies of the Fall Equinox, and will be intergenerational space with filled with music, food and discussion. The session, facilitated by Ynanna Djehuty, will utilize writing and other mediums that will help participants identify how their identities have been influenced by their personal and collective histories. When: Saturday, October 3rd starting at 5pm. Where: Justice Center en El Barrio, 1637 Park Avenue, New York, NY 10029. The Justice Center en El Barrio is a dynamic new space for social justice and community organizing, committed to building the people’s movements. The Justice Center is home to five organizations focused on everything from fitness justice, to fighting police brutality, recovering workers’ unpaid wages and defending women’s reproductive rights. Regular programs include community forums, book clubs, film showings, free and low cost fitness classes and open mics. Ynanna Djehuty is an Afro-Dominicana born and raised in the Bronx. She is a midwife, reproductive health activist and writer. The focus of her work is the empowerment of women and people of the African Diaspora. Ynanna is the creator of These Waters Run Deep, a multimedia journey into the lives and struggle of Afro-descendant women. Using reproductive and maternal health as a lens,These Waters Run Deep artfully weaves narratives that highlight the socio-political landscape by through which women of color have learned to endure for generations. In October 2009, the Afro-Dominican speaker published ‘Hija De Mi Madre’ (My Mother’s Daughter), a combination of memoirs, poems and research material focusing on the effects of race on identity. Ynanna is the co-founder and associate editor of La Galería Magazine, an online publication for Dominicans of the Diaspora.